Song is 3 or 4 short clear notes followed by buzzy “tow-wee,” and ending with a trill. Description: Sexes similar. 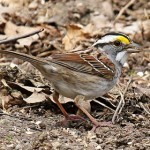 Plumage is highly variable. 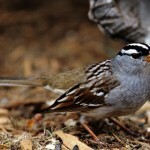 All have long, rounded tail that is pumped in flight; broad grayish eyebrow; and broad dark stripe bordering whitish throat. Reddish-brown upperparts are usually streaked; underparts are whitish with dark streaking on sides and breast that often converges into central breast spot. Pinkish legs and feet. Juvenile is buffier overall, with finer streaking below. 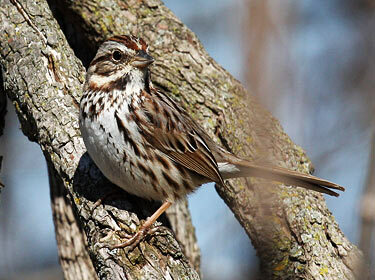 Habitat: Weedy areas, streamside woodland edges, forest margins, brushy edges of ponds, and shelterbelts. 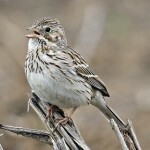 Where in Nebraska: Common spring and fall migrant and uncommon winter visitor across the state. Local summer resident. Breeding probably limited to northern and eastern parts of state. Field Notes: 34 recognized subspecies ranging from large, dark-colored, large-billed birds to small, sandy-colored, small-billed birds. Fun Facts: Mockingbirds are not able to effectively imitate the song of a Song Sparrow.